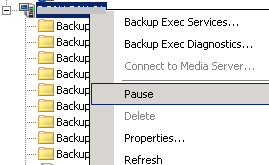 When I checked the Backup Exec this morning, it shows ‘Communication Stalled’ in the job status. According to my research, this should be a bug in the Backup Exec. To fix this, the work around is to pause the media server, then un-pause it. If the jobs failed to recover from this issue, you may need to reboot the media server. Drop us a line if we can help with this one. Thanks. This has been solved.